352 Marlborough is located on the south side of Marlborough, between Gloucester and Hereford, with 350 Marlborough to the east and 354 Marlborough to the west. 352 Marlborough was built in 1878-1879 for building contractor George Wheatland, Jr., one of eight contiguous houses (348-350-352-354-356-358-360-362 Marlborough) built in 1878-1880 for him. 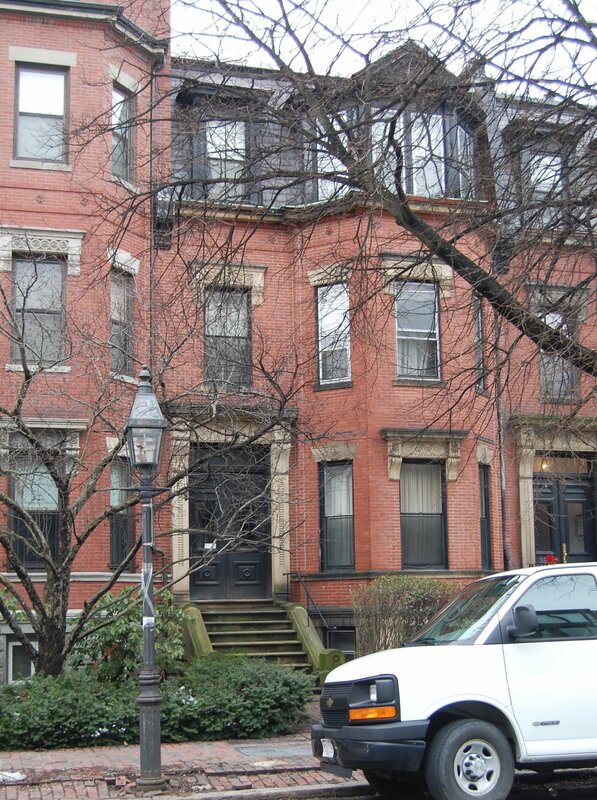 Click here for an index to the deeds for 352 Marlborough. George Wheatland, Jr., subdivided the property into eight lots, seven with 23 foot frontages and the eighth, at the corner of Hereford, with a 24 foot frontage. He then built houses on the lots at 348-362 Marlborough, each of the same design, with the entrance on the left nd a bay on the right. On October 6, 1879, 352 Marlborough was purchased from George Wheatland, Sr., by Mrs. Anna Lothrop (Motley) Rodman, widow of Alfred Rodman. She probably also maintained a second residence in Dedham, where she had lived with her husband (who died in June of 1853) and raised their two children, and where they continued to live with their spouses. She continued to live at 352 Marlborough in 1893. During the 1893-1894 winter season, Mrs. Rodman was living elsewhere and 352 Marlborough was the home of John Vaughan Apthorp, a dealer in real estate and mortgages, and his wife, Mary Sarah (Sargent) Thomas Apthorp. They previously had lived at 321 Dartmouth. 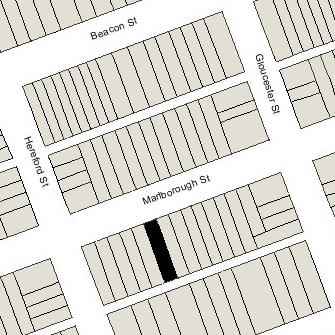 By 1895, the Apthorps had moved to 31 Gloucester and 352 Marlborough was once again the home of Anna Rodman. The house was not listed in the 1899 and 1900 Blue Books, and Mrs. Rodman may have moved permanently to Dedham about that time. Her daughter, Eloise, the wife of Stephen Minot Weld, Jr., died in February of 1898, leaving several teen-age children, and it seems likely that Anna Rodman may have returned to Dedham to help care for them. Anna Rodman was living in Dedham with Stephen Weld and his children at the time of the 1900 US Census. 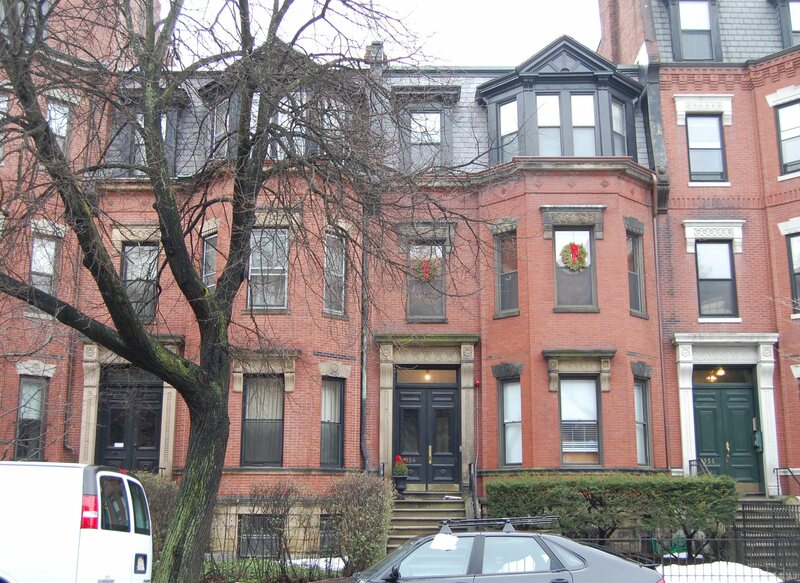 352 Marlborough remained in the Rodman family, and by 1901, had become the Boston home of Anna Rodman’s son, attorney Alfred Rodman, Jr., and his wife, Harriet Delia (Risley) Rodman. They also continued to maintain a home in Dedham. During the 1904-1905 winter season, Anna Rodman resumed living at 352 Marlborough, with Alfred and Harriet Rodman. She died in March of 1905. On May 13, 1905, 352 Marlborough was purchased from Anna Rodman’s estate by Elizabeth Kinnicutt (Francis) Wentworth, the wife of Dr. Arthur Howard Wentworth, a pediatrician. They previously had lived at The Marlborough at 416 Marlborough. Elizabeth Wentworth died in December of 1918, and by 1920 Arthur Wentworth was living with his children in Brookline. On February 24, 1919, 352 Marlborough was purchased from Elizabeth Wentworth’s estate by Eliza Robinson (Swift) Chute, the wife of Dr. Arthur Lambert Chute. They had owned and lived at 350 Marlborough, next door, since 1906. They also maintained a home in Falmouth. Dr. Chute was a urologist and later also would become a professor at Tufts College School of Medicine. In March of 1919, Eliza Chute filed for (and subsequently received) permission to convert 352 Marlborough from a single-family dwelling into medical offices. Thereafter, it became Dr. Chute’s office. He later was joined there by his son, Richard Chute, also a urologist, who lived with Arthur and Eliza Chute at 350 Marlborough. Arthur Chute died in January of 1934. Richard Chute married in June of 1934 to Ruth Sears, an archeologist. After their marriage, they lived at 350 Marlborough and Eliza Chute moved to 352 Marlborough, where Richard Chute continued to maintain his medical office. 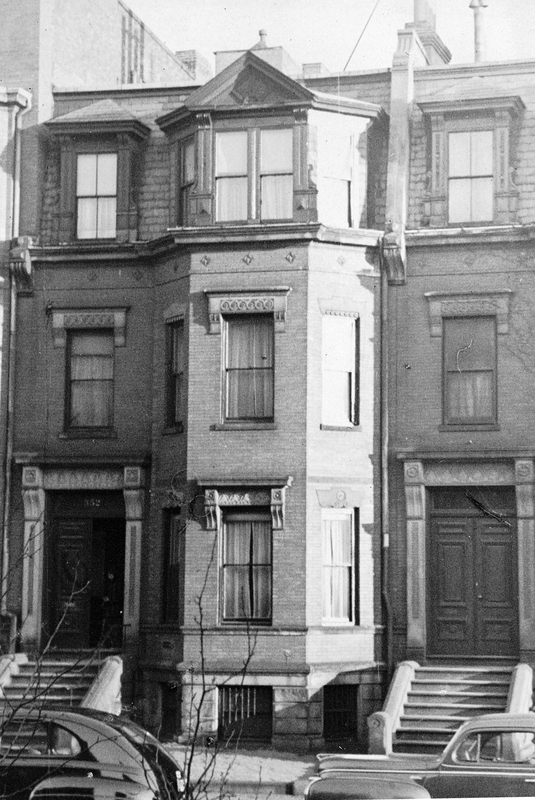 Eliza Chute continued to live at 352 Marlborough, and Richard Chute continued to maintain his medical office there, until about 1942. The house was shown as vacant in the 1943 City Directory. On April 8, 1943, 352 Marlborough was purchased from Eliza Chute by Patrick Kearney and his wife, Rose E. Kearney. They previously had lived at 217 Beacon. He was an engineer with the Boston Gas Company. In December of 1943, Patrick Kearney applied for (and subsequently received) permission to convert the property from a single-family dwelling and doctor’s office into a single-family dwelling and lodging house. They continued to live — and probably operate a lodging house — at 352 Marlborough until about 1961. On May 15, 1961, 352 Marlborough was acquired from the Kearneys by Irving Singer, an author and professor of philosophy at MIT, and his wife, Josephine (Fisk) Singer, a former opera singer. They occupied the house as a single-family dwelling. On May 5, 2005, they transferred the house into Josephine Singer’s name, and on January 14, 2012, she transferred it back to her husband. On September 26. 2014, he transferred the property to their daughter, Margaret Singer, as trustee of the 352 Marlborough Street Realty Trust. The Singers continued to live at 352 Marlborough until their deaths, Josephine Singer in October of 2014 and Irving Singer in February of 2015. On July 22, 2015, 352 Marlborough was purchased from Margaret Singer by the Lake Marlborough Nominee Trust (Anastasios Parafestas, trustee). In November of 2015, the Lake Marlborough 362 Nominee Trust purchased 362 Marlborough. The trusts were formed for the benefit of Stephen Pagliuca and his wife, Judy Pagliuca. At the time of the purchase, Stephen Pagliuca was managing partner of Bain Capital and co-owner of the Boston Celtics basketball franchise. They also maintained a home in Weston. 352 Marlborough remained a single-family dwelling in 2015.